What says “spring” to you? Navy and white, of course. But I am also partial to fresh greens at this time of year. To the right — just flick your eyes over — a green dress. 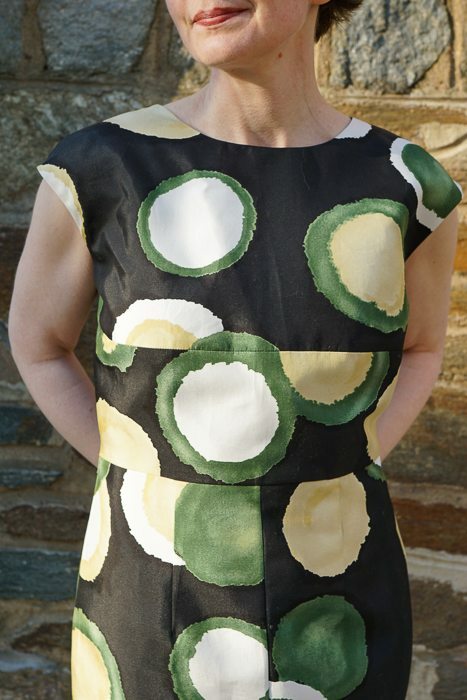 OK: Technically, it’s a black dress, but so much of the surface is green, yellow and white that it doesn’t read black. I think it reads spring. 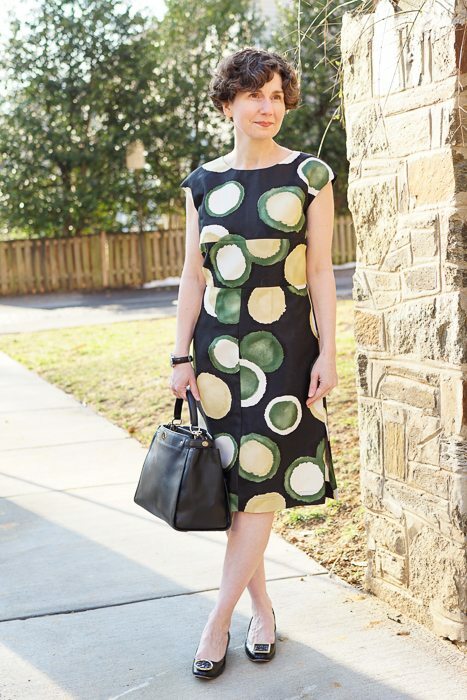 This dress is a crisp silk-cotton blend and stands away from the body. I think it looks a little slimmer in person than it looks in these photos, but I may be wrong. These photos may be 100% faithful and reliable . . . in which case, perhaps I should not have bought this dress. But I love these dots. Are they dots? Or eclipses of a green sun? Tell me what you see: first thing that pops into your mind! The Photographer puzzled over the misalignment of the polka dots at the seams and asked what it was all about. A fair question! Often a failure to align stripes or large patterns is a sign of cheap construction. Here, however, the answer is: Marni. 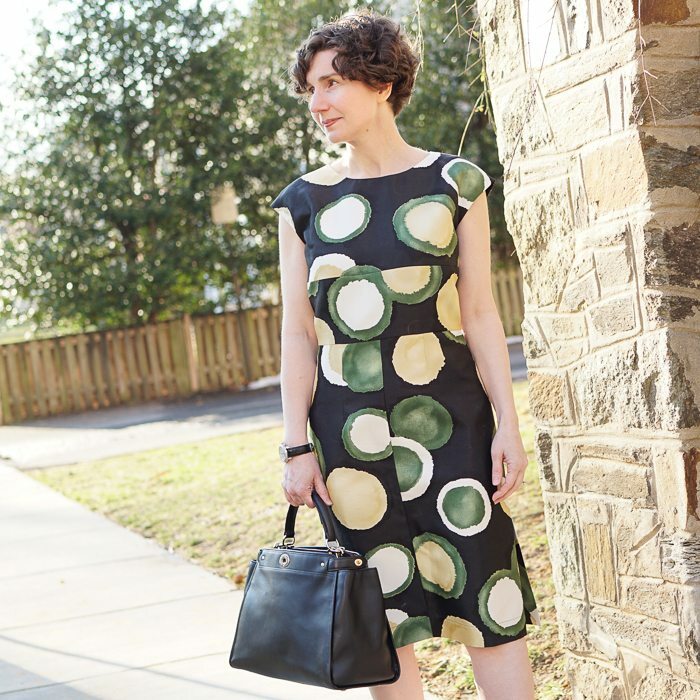 The dress is Marni and the failure to align is representative of whimsy, insouciance, or some other privilege of immutable awesomeness originating in Milan. As seen earlier this year, Marni is capable of pattern matching in the texture of a matelasse. * You, Dear Readers, have seen Trojan Cupcakes, reproductive organs and pinecones in previous posts. Erm, petri dishes… but I do love the dress. This outfit for me is the essence of “Directrice style”. Classical silhouette but whimsical execution. And the persistent battle cry: Shorter! Two centimetres, please. For objections I refer to exhibit A: The definitive sideways photo in your last post. We now have visual evidence that the Directrice’s legs are marvellous all the way, including the knees! Clicking here today, my first thought was, “Oh! That’s cute!” I see eggs over easy. I see flower-less water lilies! And on a second pass, I see hard-boiled eggs sliced open, some apparently Seussical in origin. I also just figured out accidentally that I can access the body of your post by clicking on the picture! I am apparently trained not to click there (so many other blogs immediately and greedily launch you to the product page when you do that). Much easier than scrolling back up to the post title to expand the contents, but perhaps a small “read more” link at the end of your intro would be helpful to others like me? I see a flourishing Petri dish, but it’s lovely! White watermelon slices. No seeds. Fresh and crisp! Coconuts. 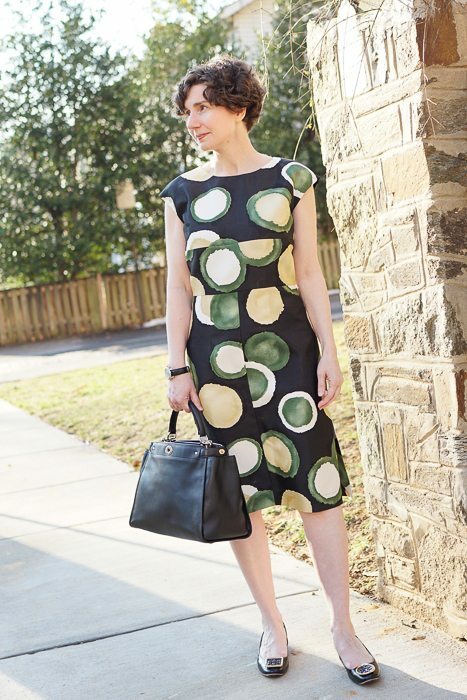 Love the dress and I also associate navy with spring. I just wore a navy and white polka dot blouse from Le Tote. I still remember the dresses my mom sewed for me the spring I was in third grade: navy, white and either yellow or red. And she made a fantastic navy cape lined in red to wear with them. I see lemons and limes – organic shapes. Somehow, the misalignment works. I can’t explain it but it’s almost whimsical. Slices of melons, of the type you only see in Europe! The spots kind of look like Turkish delight? (milky white in the edges, muted but almost vibrant colors on the inside) or the candided fruit you find in fruitcake. Flowers. I, too, love green in spring! It’s a cross section of a chocolate malted milk ball. Only in colors not used by candy makers. I know, because I dissected one as a kid. Dissected a malted milk ball, that is, not a candy maker, in case there was any confusion. I like the dress. It could be the result of a recipe which called for watermelon,egg yolks,and my favorite marshmallows. The length of the dress is perfect.